Our third and fourth days in El Nido we had scheduled to go diving, however unfortunately Chris woke up with a stuffy nose (which to be honest I’m pretty sure I gave to him, since I was sniffly two days earlier) so we cancelled those plans due to not wanting his head to explode on his first dive and traumatize him for life. He is a liiiiittle bit grumpy and whiny when sick (and grumpier now that I’ve written that haha) so we spent most of the day lounging around the guesthouse watching MTV Asia, which FYI is by far the best MTV (super dance-y K-Pop and melodramatic C-Pop videos make my life). Our other big accomplishment was finding a place to do our laundry, which was much needed at this point. We also popped out for delicious burgers/bagels at V & V Bagel down the street in the afternoon, and did a whole lot of catch up with blogging, e-mails, and photo organization. By the next day I was restless, so after breakfast a still sniffly Chris grudgingly let me find a trike driver to take us on a tour of the beaches in the area. A guy with a nice looking trike offered to drive us around for the whole day for 1500P, so we took his offer. His trike turned out to be equipped with both a stereo system (from which he constantly played dance remixes) and neon blue lights in the roofs, so it was quite the party ride. We decided to go to Nacpan Beach first, supposedly the nicest and also farthest beach in the area. It’s about 45 minutes from town and a bit off the beaten track, meaning there are a lot of hills and some EXTREMELY bumpy dirt roads to traverse. Combined with the fact that it had also rained all night created quite the adventure drive. We made it there without catastrophe though, and it was well worth it. Nacpan Beach is SO NICE. Nacpan Beach is huge and sparsely populated since it’s farther from town. There is pretty much no development there aside from some rural homes and a few little beachside cafes. Most importantly though it has literally the clearest water I’ve ever seen. The beach is beautiful. 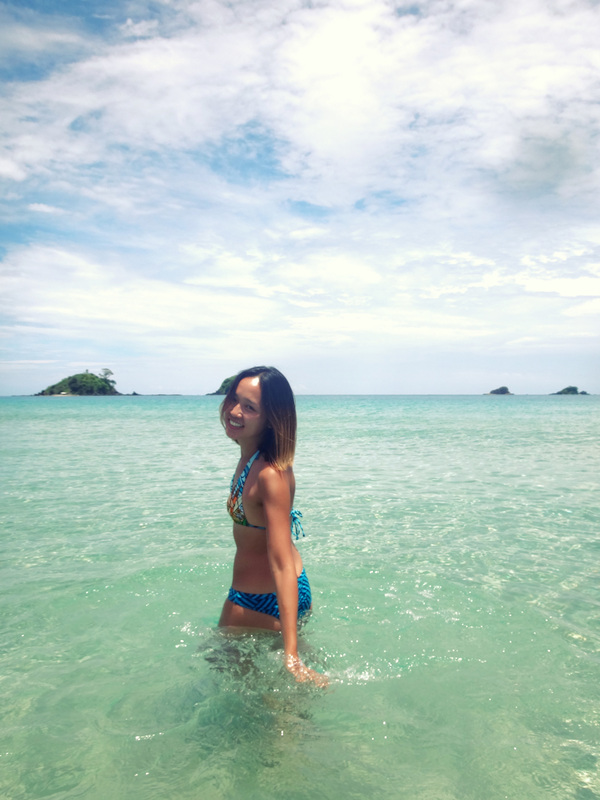 The water is also pretty warm, so we spent a few hours frolicking and having buko shakes and french fries. View from one of the beachside cafes at Nacpan Beach. When we figured we’d had enough sun we decided to head to Nagkalit-Kalit Falls. 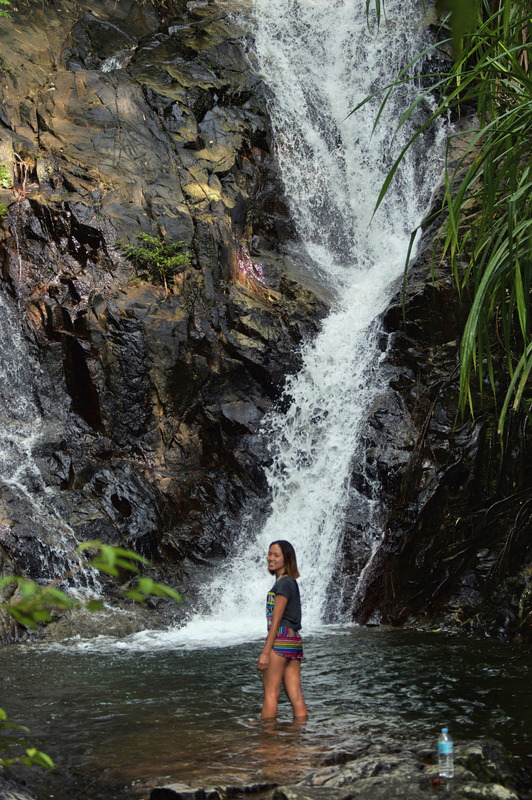 They can be reached from the road between Nacpan and El Nido, but you definitely need a guide to find them. Our trike driver was conveniently also acting as our tour guide, so he showed us the way. We basically parked the trike in what looked like someone’s yard to me, then meandered through some farmland to reach the forest and river. This part we would have never found on our own, as there isn’t really a marked path and it involves doing some things I wouldn’t usually considered following a trail, such as going through a cow pasture and squeezing through a tiny gap in a barbed wire fence. Once we hit the forest it was about 30 minutes of hiking, including fording the little river numerous times. 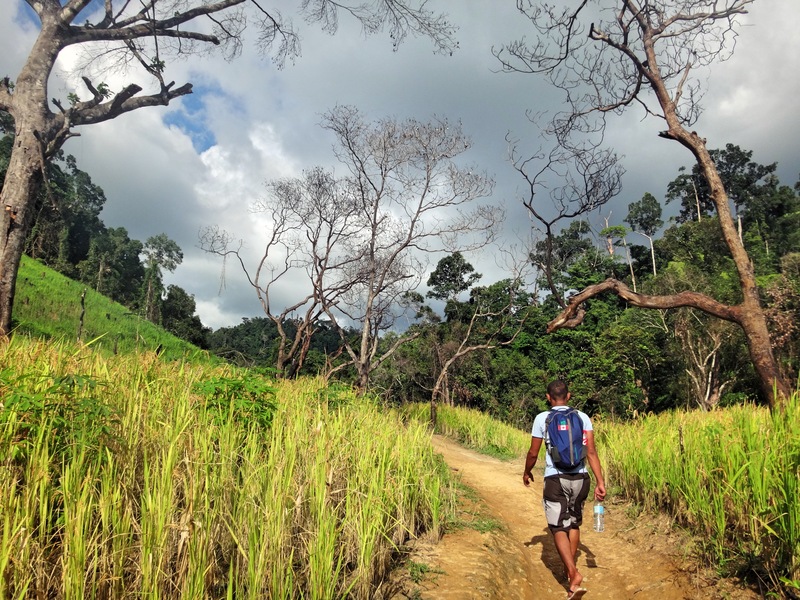 Hiking through some rice fields en route to Nagkalit-Kalit Falls. We were pretty hot once we reached the falls, which were small but picturesque and most importantly, totally uninhabited. So I took the opportunity for pretty much the most refreshing swim ever. Eventually another group showed up, so we decided to head out. 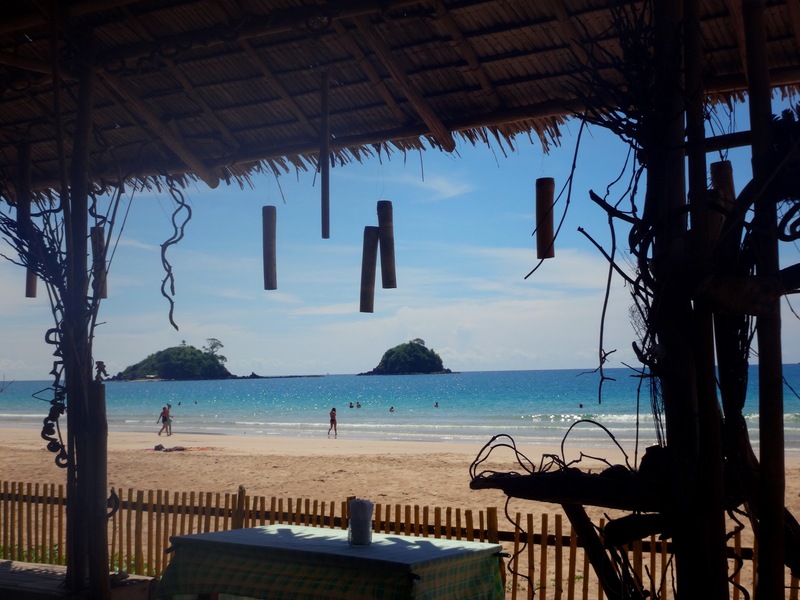 Once we were back on the trike we decided to head to Las Cabanas, a beach on the other side of El Nido known for having the best sunset in the area. The beach is only about 10 minutes from town (about 30 minutes from where we currently were), so we made it there just in time. Las Cabanas is down a big flight a stairs and is more developed that Nacpan, with some hotels and beachside bars. Mostly we laid in the sand and watched the sun go down while some local doggies frolicked around us. 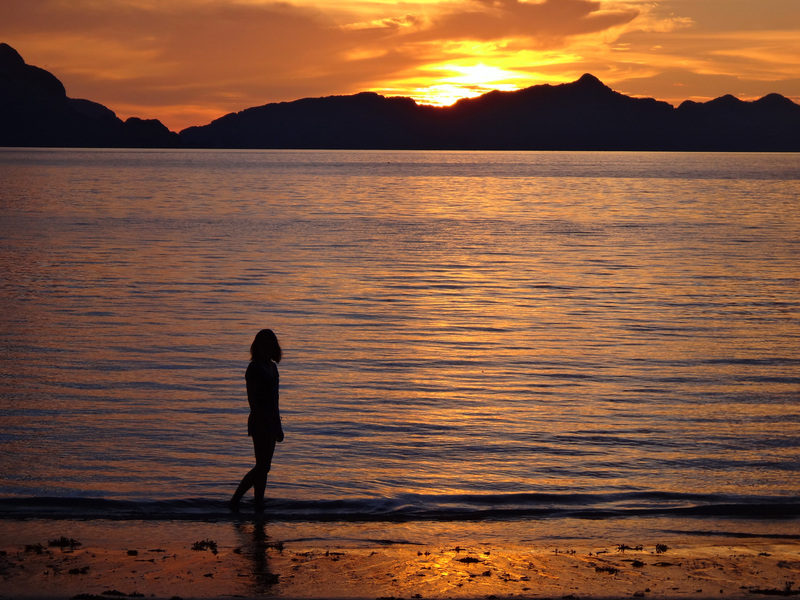 Sunset at Las Cabanas Beach.